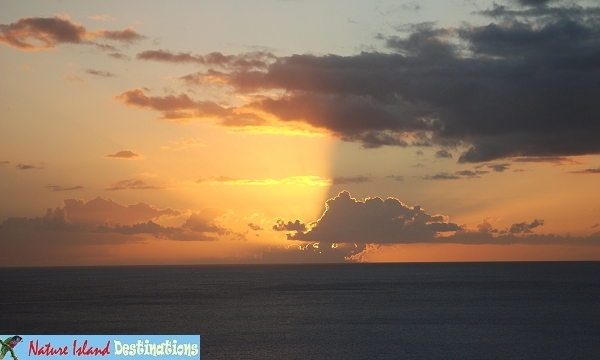 Location: Morne La Coit, Macoucherie, near Salisbury Beach and dive centre - mid west coast. 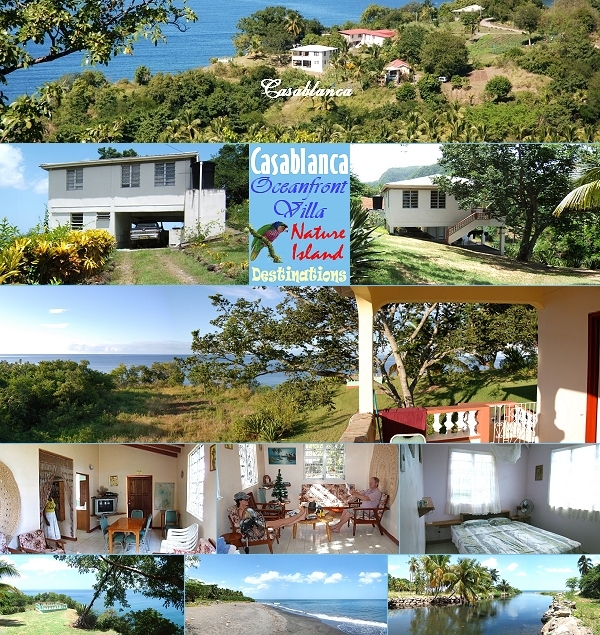 Description: A private villa on a plateau overlooking the Caribbean Sea. A private path leads to a secluded beach at the mouth of the Macoucherie River, with the options of both sea & freshwater bathing. The house is elevated & the only access is a short concrete staircase leading up to the balcony. 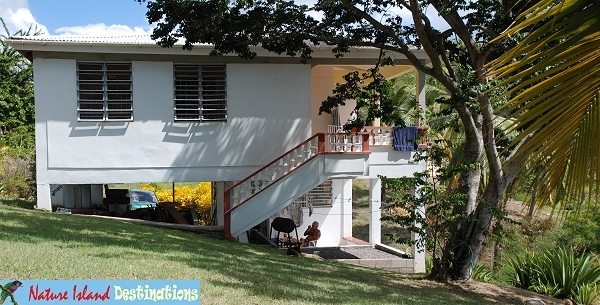 It has 3 bedrooms, fully equipped kitchen, 2 bathrooms, lounge & balcony/dining area enjoying a sea view with southerly aspect. The lounge & kitchen both open onto the balcony, which has a dining table and chairs. The lounge contains 3 seater settee, armchair, tree slice coffee table & a corner table & shelf with hi-fi & cassette tapes (mostly classical/contemporary) and TV for dvd only. The kitchen has a fridge freezer, gas hob cooker, electric kettle & an assortment of crockery, pans & utensils. 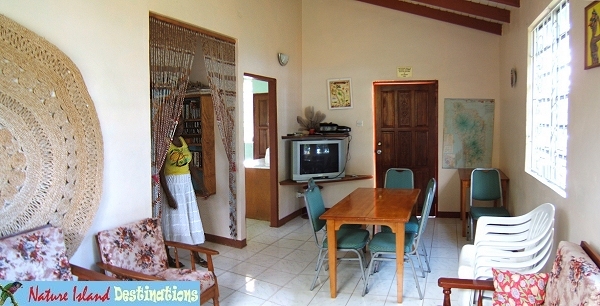 From the lounge a generous passage leads past 2 bathrooms, each with WC, whb & shower, to 3 bedrooms. Bedroom 1 has a double bed, deep wardrobe & a wall shelf with hooks below, aspect south & east. Bedroom 2 has 2 single beds & new wardrobe, aspect east. Bedroom 3 has a double and single bed, wardrobe, aspect north & east. Balustraded seating area on the cliff edge. Comments: A modest sized house with floors tiled throughout. Built in 1993 by its English owner, who resides in the UK but visits periodically for a few winter months, occupying a small apartment below the house. There is hot water to one shower only, no insect screens to windows, though 3 nets are available to hang over beds at night if required. There are stand fans but no A/C, though all bedrooms, having east facing louvred windows, are usually breezy & cool. A tranquil setting enjoying an excellent view of the the coast stretching southwards & beautiful sunsets over the Caribbean Sea. Enjoy a quiet walk or drive along the Macoucherie River valley (short trail to Hobs Hole waterfall) & up Macoucherie Hill. A 15 minute walk to the shops of Salisbury. At nearby Salisbury beach fish may be bought from local fishermen and scuba diving can be arranged with the East Carib Dive Club, where you may relax at their beach bar and daytime restaurant, Chez La Douche. Approx. 100 yards from the house is the Tamarind Tree Restaurant. 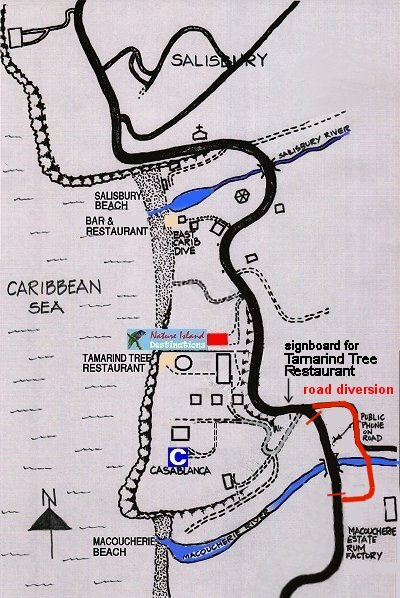 A private road leads to the main coast road (Portsmouth 35 min., Roseau 30 min., Melville Hall Airport 1 hour, Canefield Airport 20 min.) A good central location, convenient for the natural attractions of the Layou River, Morne Diablotin National Park, Syndicate Trail, Indian River & Cabrits National Park. Good for snorkelling in the surrounding area. Please note that in September 2017 Dominica was hit by category 5 Hurricane Maria. Casablanca survived remarkably well with only minor damage, all of which has now been repaired. Restoration nationally is ongoing but there are still limitations regarding land line telephone and internet, which can be overcome with the use of cellphones and data. Casablanca is once again available to accommodate visitors. 17th Jan 2019 update: Internet restored.